We are based in the Shreveport/Bossier City area of Northwest Louisiana with many members hailing from the extended Ark-La-Tex region. Typically our membership numbers at least 225 by the end of each fiscal year (which runs from July to June). Red River Quilters began as a group of friends kicking around the idea of forming a guild in the area. These ladies were named Pat Birmingham, Louise Cooke, Thelma Green, Gloria Ingram, Alice Pearce and Pam Pelletier. Pat located a meeting room at the Pierre-Bossier Mall, booked a meeting date and started spreading the word through fabric stores, quilt shops, the Extension Homemakers and the local media. March 8, 1983 was the big day. That evening 42 ladies arrived to talk about quilts. The next thing you knew, officers were elected (Pat Birmingham – President, Thelma Green – Vice President & Louise Cooke – Secretary) and the Barnwell Center was secured as a regular meeting place. Red River Quilters was off and running! As is true today, the purpose of these early gatherings was to appreciate & preserve quilts. It was decided the meetings were to be educational and entertaining while providing a place for fellowship and sharing. Rust and grey were chosen as the official guild colors. Bylaws were composed and tax-exempt status was obtained. An afternoon meeting was added in August of 1983 as evening meetings were not convenient for everyone. Tributaries began to form in 1984, giving members opportunities to share their love of quilting – and desserts! - in smaller, less formal groups. In February of 1985 Red River Quilters hosted “Spring Thing”, the forerunner of what is now our annual quilt show. This was a seminar held at the Isle of Capri Hotel in Bossier City. “Spring Thing” evolved into “QuiltFest” which was the basis of the Quilt Show held the first weekend of the Red River Revel Arts Festival every October. That’s a lot of years coordinating quilt entries, special exhibits and vendors! Even in the early days Red River Quilters reached out to help the local community. The first such project was the making of stuffed animals for children at the Northwest State School at Christmas. Other organizations benefitting from the compassion of the Red River Quilters have included Holy Angels School, Shriners’ Hospital, Providence House, the YWCA Family Violence Shelter, the American Red Cross, Festival of Trees, the Cara Center and LSU hospital. From this firm foundation the guild has evolved to a group of about 250 members. We still have both an afternoon and evening meeting on the first Monday of each month. Tributaries continue to meet regularly, several of which date back to 1984. The quilt show is still an annual event. We have quite a list of service projects. 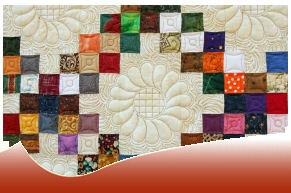 And, of course, we continue to nurture the love of quilting!